KAI Japanese Language School is proud to be accredited by the organizations below. Association for the Promotion of Japanese Language Education was established in 1989 for the purpose of improving Japanese language institutes in quality and letting foreign students study Japanese comfortably and at ease. KAI Japanese Language School is a member of the association and we have been certified that we comply with their third-party assessment standards, which is their newly established certification with stricter requirements. The result of the third-party assessment can be viewed here. IALC is an international quality association to accredit and represent private, independent language schools teaching the official language(s) of their country. As of January 2018, there are 144 IALC schools in 21 countries worldwide. In 2005, KAI Japanese Language School became a member of IALC and we commit ourselves to accept the IALC Code of Ethic. 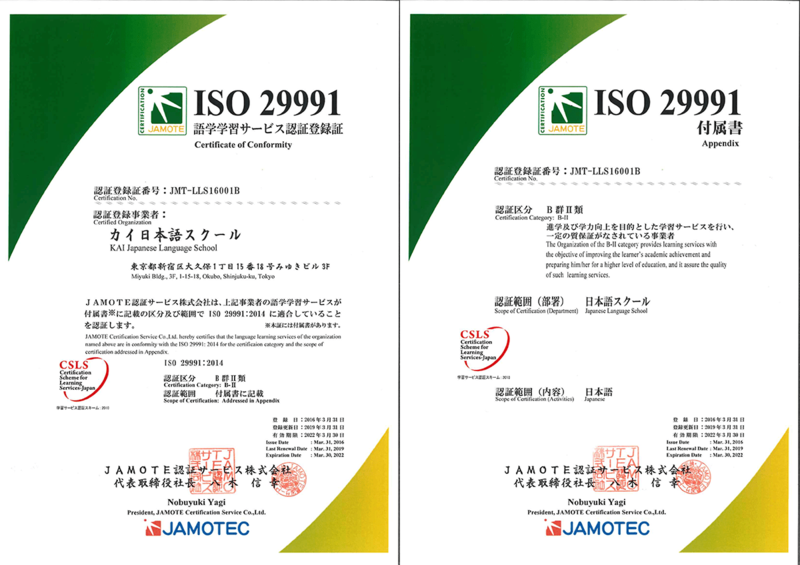 ISO 29991 was derived from ISO 29990 (Learning services for non-formal education and training) and it defines requirements specializing language learning services. 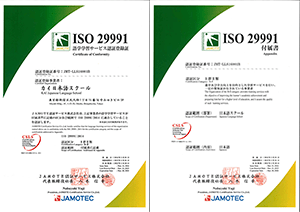 We have received ISO 29991:2014 certification (Language learning services outside formal education－Requirements) on March 31, 2016.